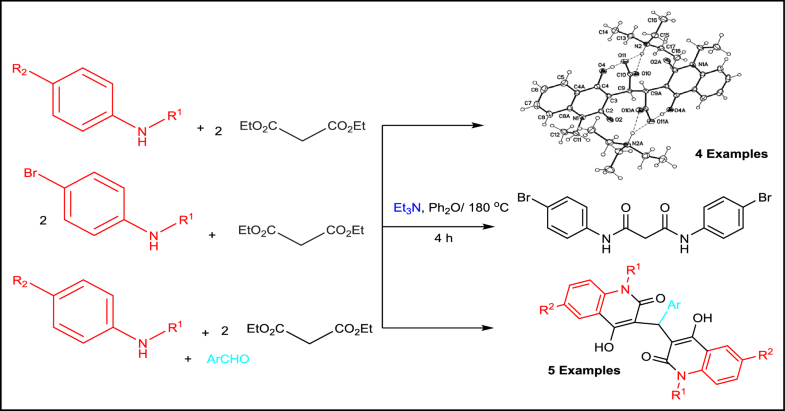 In this investigation an efficient synthesis of 2,3-bis-(4-hydroxy-2-oxo-1,2-dihydroquinolin-3-yl)succinic acid derivatives was achieved by one-pot reaction of one equivalent of aromatic amines with two equivalents of diethyl malonate in diphenyl ether and catalyzed with triethylamine. In case of applying the previous condition with aromatic amines and diethyl malonate in a ratio of 2:1, no quinolone structure was obtained, whereas N1,N3-bis(4-bromophenyl)malonamide, as an example, was obtained in 95% yield. Under the same previous condition, arylmethylene-bis-3,3′-quinoline-2-ones were in one pot synthesized via the reaction of equal equivalents of aromatic amines and diethyl malonate together with half equivalent of the corresponding aromatic aldehydes. 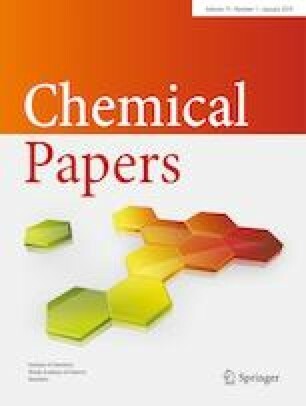 The structure of the obtained compounds was proved by IR, NMR and mass spectra and X-ray structure analyses. Authors thank the DFG-funded Transregio 3MET (TRR88), Karlsruhe Institute of Technology; Karlsruhe, Germany for 1 month of financial support for Professor Aly to enable him to carry out the analyses.